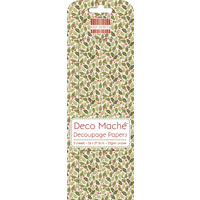 Tiled Seaside pattern make this pack of decoupage papers perfect for so many projects. 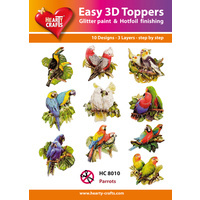 You can use these on a variety of surfaces including wood, plastic, metal, glass and of course chipboard and card. Decoupage is a fascinating hobby and needs very little other materials. You will need to use a sealer on your finished work unless you are using them on greetings cards, then they are okay plain and unvarnished or sealed. 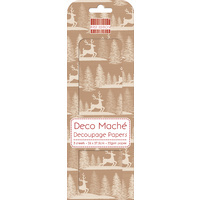 Directions for use: Deco Maché is easy to use just prep your surface with white paint. When dry, paint a layer of decoupage glue. Tear and stick down your paper, slightly overlapping each piece. Seal with another layer of glue.